My Friday started out slammed with calls / meetings starting at 6am, and it wasn’t until 9am that I looked out the window and realized… it was a blizzard! I had a lot of trouble driving to my 10am meeting, and even more trouble getting home afterward. Coming up McCaslin, I counted five cars that were just totally stuck on the side of the road, unable to make it up the hill. I was thanking my lucky stars that my Jeep was able to make it, especially since I know I am overdue for some new snow tires. But I spoke a little too soon, as when I got to my street and tried to pull into my garage, I got stuck trying to get up the small hill that is my driveway! These were the worst road conditions I have ever seen, and after a few emails from other people expressing similar concerns, I promptly rescheduled all my afternoon meetings in Denver… not worth the risk to try to drive there. Of course, as soon as I canceled the meetings, though, the snow significantly let up – and an hour later, it was just a normal storm. I needed to get out to the mountains that night, and my friend Chris advised me that I ought to leave ASAP, as this might be the only window of time where the roads were decent. This is where I feel like I am so lucky to have a place up there that’s mostly stocked – I just threw a few things into a bag and headed out the door in 10 minutes flat! Unfortunately, that’s where my luck ran out a little bit – leaving the Front Range at 3pm turned out to be everyone’s plan, too, and I was immediately mired in traffic. We were crawling forward around 10-30mph most of the way, and that dipped down to no more than 5mph coming out of the Eisenhower Tunnel into Dillon. It ended up taking me four hours to make the (normally 90 minute) drive, which really sucked. In contrast, my friend Justin came up early Saturday morning and hit zero traffic… so I wagered wrong in thinking Friday afternoon would be better. But on the bright side, I had a lot of productive work calls on the way. Lately, calls for me to hear updates and make decisions are a much bigger part of my work day than actually putting things together in Powerpoint / Excel, which gives me a lot of flexibility. I like being able to take conference calls from the road (using Bluetooth) – it forces me to pay attention instead of trying to multitask like I inevitably do when I’m at my computer. 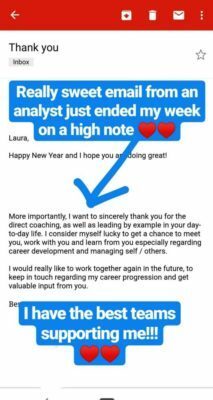 Also on the bright side: this sweet email from one of my analysts that came through around 6:30pm! I feel so lucky to work with so many wonderful people. I finally got into Vail around 7pm, and while I had originally optimistically thought I’d go out to dinner, I scrapped that plan and instead headed to Safeway for a few ingredients to cook. Mushroom pesto pasta loaded with zucchini and chickpeas – yum! I hoped that burst of carbs would give me the energy to ski long and strong the next day. I slept hard that night (I usually sleep really well in the mountains), and woke up late at 7am to a text from my friend Justin that he was already almost there. I quickly got ready and hurried to meet Justin and his friend Lawrence at West Side Cafe… which has awesome banana pancakes. But Justin and Lawrence were eager to hit the slopes, so pancakes were not to be! Instead, I wolfed down a Clif bar and we caravaned over to Lionshead Parking Garage to start our day. I’m really proud of myself that I’ve learned Vail so well over the last few weeks – I was able to get us to the Back Bowls very quickly, taking the guys up Born Free and then Avanti, then down Ouzo to Game Creek, and finally up Game Creek and down Sundown Bowl. Ouzo seems to be a little known way into Game Creek (but it’s way better than taking the long cat track from Eagle Bahn Gondola), and the Game Creek entrance to Sundown Bowl is another seemingly unpopular favorite – there’s always so much great snow over on Ricky’s Ridge, and it’s a beautiful way down! The bummer is that High Noon Express takes you up to the other side of Sundown, so you can’t really keep doing Ricky’s Ridge and that side of the bowl unless you keep bouncing back and forth between Game Creek and Sundown (which means a lot of cat tracks). Okay, Vail navigation segment over… sorry to bore those of you who don’t ski / haven’t been to Vail! Before we started skiing, Lawrence mentioned that Justin had said I was a really good skier – which pleasantly surprised me. I’ve skied a lot this year, but it’s still a shock when someone calls me a good skier. 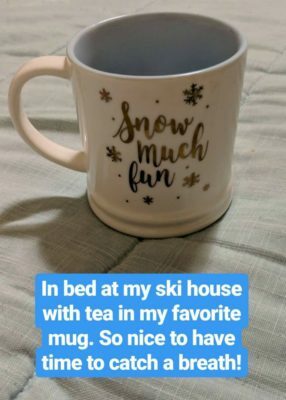 Like so many other areas in my life where the imposter syndrome is strong, I’ve always thought of myself as fairly mediocre at skiing, so it was awesome to hear otherwise. But as the day continued, we ventured into a lot of new-to-me areas and I ended up doing pretty well. I hadn’t really been much beyond Sundown Bowl before this weekend, but I found a new favorite in the Shangri La Glades over in China Bowl – tons of fresh powder, wide open trees, and some fun moguls coming down the lift line to finish. (Who would have ever thought I’d describe moguls as fun?) In all, we really had a great day on the mountain, capping it off with a round of drinks at Garfinkel’s before the guys headed back to Denver and I headed home for a quiet night of reading. Sunday morning I was able to pack up the car and sneak in two quick hours of skiing on Sundown Bowl (no time to get over to Shangri La), and then I headed back to Denver around 10:30am. 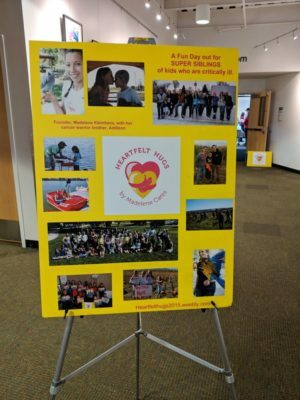 While I would have liked to ski more, I was scheduled to volunteer with Heartfelt Hugs, one of my favorite charities in the Denver area! A welcome sign with photos from previous events! 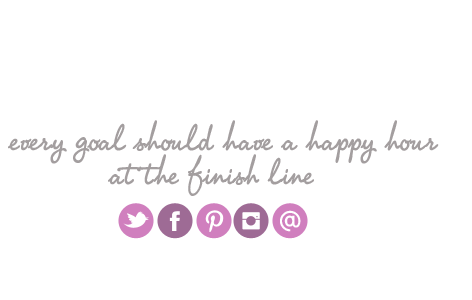 Heartfelt Hugs is a nonprofit that was started by Madelene Kleinhans when she was just ten years old. Madelene’s brother was diagnosed with cancer, and she got the idea to organize fun, free events for the siblings of children with critical illnesses, who are often lost in the shuffle. 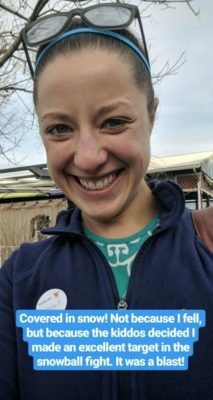 I started volunteering with Heartfelt Hugs last year, and I was really excited for this annual event: ice skating on the outdoor rink in Louisville! I hadn’t been skating in years, and was super excited. The event kicked off with some intros and games in the library, and then we headed out to Steinbaugh Pavilion for hot cocoa and ice skating. However, it was such a beautifully warm day that the hot cocoa was hardly necessary! The ice was pretty torn up due to the popularity of the rink and the warm sun melting it fast, but the kids had shovels they could skate around with and smooth out the ice. In scraping off the ice, they generated piles of shavings that proved to be perfect for making snowballs… and I became the target of many of those, skating backwards around the rink as the kids came at me and pelted me with their snowballs. It was a blast! Good thing I wore my ski clothes to the event even though it was warm out! Finally, I wrapped up my weekend with a long-overdue catch up with several of my oldest Colorado friends, who met up at my house for an old-fashioned game night. Craving something healthy but hearty, I had thrown this quinoa chili into the crockpot before I headed out to ice skate. It only took a few minutes to dump everything into the crockpot – I like recipes like this! And my friends raved about it and asked for the recipe. 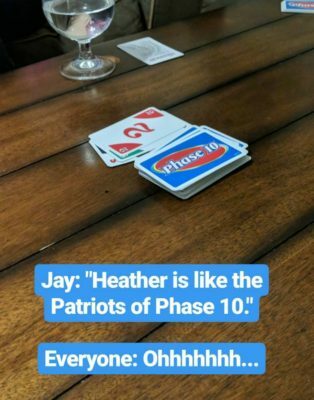 But more importantly, we had a blast catching up and playing Phase 10, a card game that Adam introduced me to several years ago but I hadn’t played since. It was a blast, but took a lot longer than I remembered… and we didn’t even finish! I was disappointed we couldn’t go later in the evening, but it was a “school night”, after all. Heather absolutely ran away with the game, ending several phases before I had even finished one. Better luck next time!